Lone rider passing an abandoned harvester, near the ghost town of Giles, Utah. so cool. really nice capture. I have to wonder how long that's been sitting there. Looks like something from the very early 1900's to me. What an incredible find. I like how you captured the cowboy too. I like this photo and it's atmosphere. great place… it looks really like in another time. Pretty desolate, that's for sure. Nice image. The lone rider is a very nice addition here. 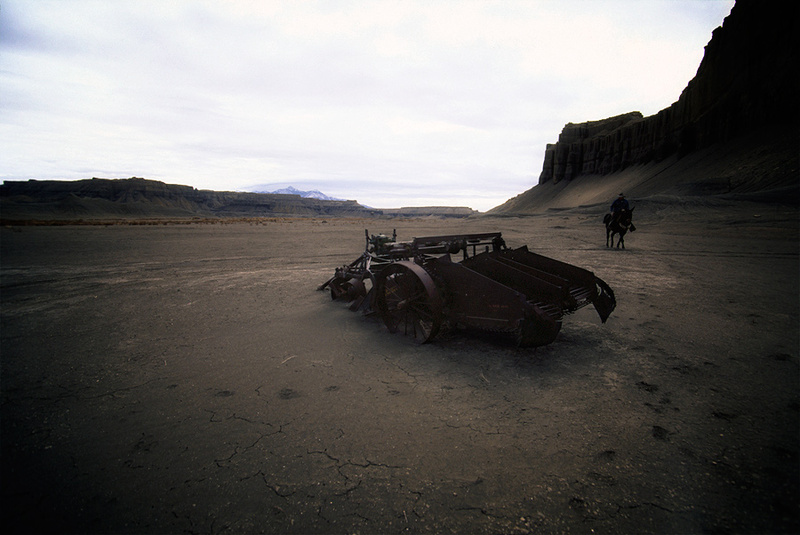 i love shots like this of abandoned and decaying machinery; fine mood and the scenery is great…but the addition of the lone rider moves this shot up a gear. were you mounted too? how do you travel in these areas? Definitely captured the ghost town effect with this image. Excellent dark contrasts and tones in this fascinating image. The lone rider really enhances the mood in this great compostion. very cool place to photograph. and the angle is superb. and yes the cowboy adds more interest to the shot indeed! I don't know what I can say that hasn't already been said. Truly an excellent image. This is great. The vignette creates a strong focus effect and helps evoke mystery in the shadowy peripheral areas. A totally successful piece of work in my view. Great idea. Nature will eventually reclaim this space. oh wow. kind of like a movie shot. the lone horseman approaching in a steep canyon. very western. great shot. Definitely feels as if time has taken a leap backwards. Love the vignette and the processing here-works very well! oh man – all those darks against that white/blue sky and the peek of mountains! Very sci-fi… Star Wars or Dune? I have just gone through your world… I am wrapped by this picture. Haughtiness!! !